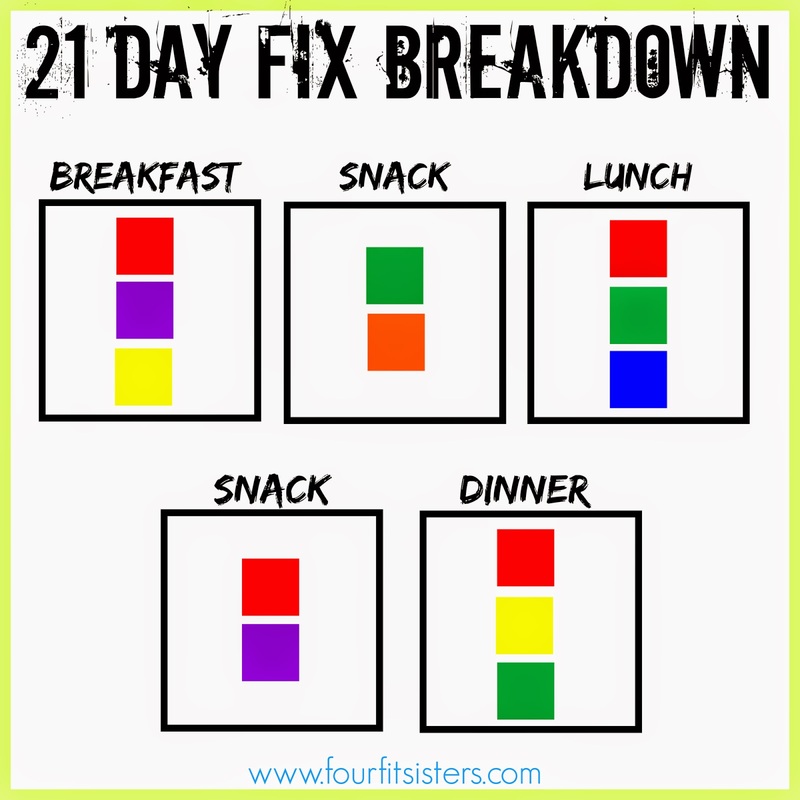 Just popping in here to share a few visuals to help with your 21 Day Fix & EXTREME diet plans. 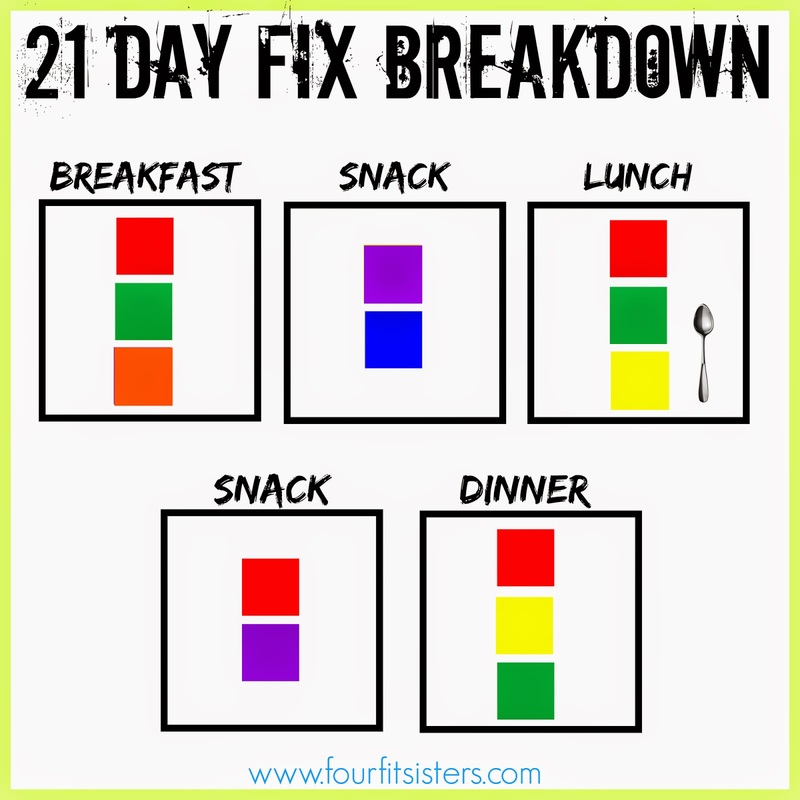 The diet aspect of the Fix programs looked a little overwhelming at first. For those that don't know anything about it let me share a little bit of information. 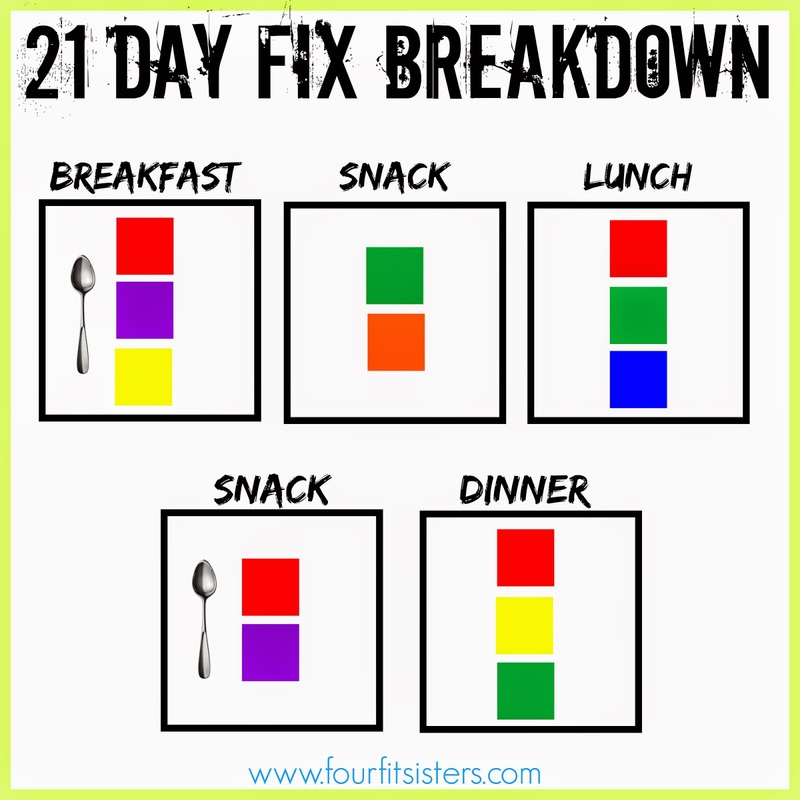 In the 21 Day Fix diet you have portion controlled containers. You are to measure out your food using the containers. Each person could be on a different calorie intake. This must be figured out first. I am on the calorie range for 1299-1499 calories. All of the visuals that you see below fit the breakdown for that range. Each caloric range has a certain number of containers that you can eat daily. In my case I get 4 reds(protein), 3 green(vegetables), 2 purple(fruit), 2 yellow(carbs), 1 orange(seeds or dressings), and 1 blue(healthy fats). You are also allowed 4 teaspoons of your favorite "nut" butter, such as peanut or almond butter. Seeing the little boxes spread out throughout the day made it SO much easier to understand and help plan out my days. I have made several different visuals. Mix and match to see which one fits your lifestyle best. Are you a carb in the morning person?? Or can you wait until lunch?? There is a visual to fit your needs. Try one out one week and another one out the next. The only meal that will NEVER change for me is DINNER!!!!!! We are a meat, vegetable and carb type of family when it comes to dinner time. It is the easiest and most family friendly, in my opinion. I am not cooking two meals at night. So if we do some sort of grilled or smoked meat for dinner, throw in one of our favorite vegetable, such as asparagus, and then a delicious side of wild rice we are set. This is what works for me and for our family 99% of the time. Then all I have to do is measure and then eat. My husband can eat more if he wants, but the breakdown is there for success!!! Enjoy these visuals and share them so your life is easier. If you have any questions please feel free to leave a comment!!! I will be working on other caloric ranges very soon!!!!!! This is great! I have done something similar but like these better. 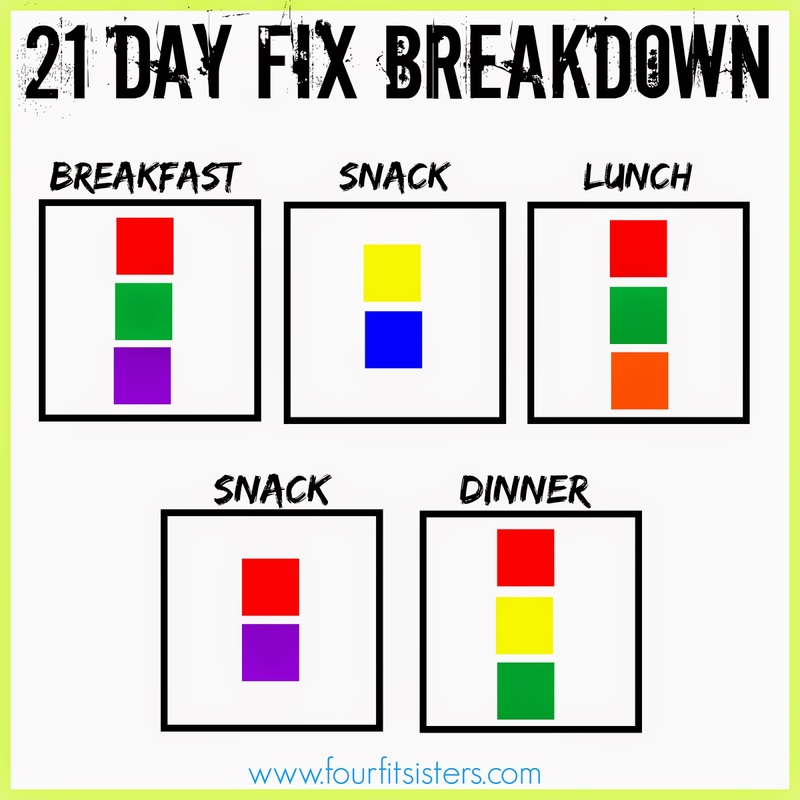 I love that chart of yours and the colors and all that :) Would you email me the file so I can change it to what I need daily? My email is cobradriver@gmail.com And Thank You so much! !